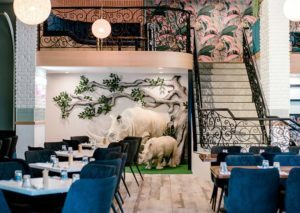 With a capacity to seat over 200, the venue opened on November 1 and features a life-sized rhino replica, five-metre-high ceilings and a giant rock wall and waterfall. Spread over two levels, there is a waterfall bar and open-air outdoor garden downstairs and upstairs, a private mezzanine floor perfect for romantic dinners and special functions. The 700-square-metre venue has 80 staff led by top restaurateur Adam Dundas-Taylor and ex-Island rooftop general manager Adam Thring. Adam trained under Jamie Oliver in London and later worked in Nobu Mayfair, which has been rated among the top 10 restaurants in the world. He has also catered for Beyonce and Leonardo DiCaprio, and he personally cooked for Elton John’s wedding! White Rhino is the brainchild of Artesian Hospitality partner Matt Keegan who signed Adam up to design the menu and offer delicious modern Australian food. The all-day menu features bar staples including pizza and burgers and a lunch and dinner menu of fish and slow-cooked meats. The client chose a classic balustrade design from our website, which we tailored to suit the venue’s setup and the client’s individual needs. The bespoke balustrades also had to ensure customer safety, so we designed 35 metres of balustrading on the lower level and the mezzanine level. Because our designs are made from wrought iron that won’t rot or rust, it was a great solution for semi-open premises. It also looks incredible combined with the amazing décor the restaurant is outfitted with! We worked closely with both the owners and Builder Ready Building to fashion these unique balustrades, and we actually had quite a tight time frame to complete the job in – only three and a half weeks! However, the client is thrilled with the result and we’re actually pretty pleased with the job ourselves! Stop in for a meal and check them out when you’re next in Surfers! We manufacture, design and install robust and elegant balustrades in Brisbane homes and businesses and on the Gold or Sunshine Coasts as well. Handcrafted to suit your design preferences, every separate baluster can be a feature in itself, and all our designs comply with the relevant specifications and building codes. Also, unlike timber or aluminium that can rust and rot, wrought iron will stand up to all weather conditions, making it the perfect material to use for balconies, deck and veranda balustrading. After some bespoke balustrades for your home or workplace? Contact the experts at Dean-Wilson Iron on 3814 0076.